It is believed that a mill has existed on this site since 1670 although the earliest report is of the year 1808 (Wharton) giving it as a Corn Mill. This property dates back to the 12th Century and it is where Thomas Savin, the great Railway entrepeneur was born. The building still exists with a large iron wheel and associated shafts and gears, situated in a large pit below ground level. The wheel is not now accessible, but it is believed to be 4 by 1.75 metres, with the top about 3 metres below ground level. From the still visible sluicegate off the River Morda, the headrace runs some 470 metres, via a second weir, under the Trefonen Road and up to Ivy Cottage, from where it was formally carried underground by a culvert, traces of which were discovered during repair work to the farm sheds. The head and tail races are still seen in part, in various stages of advanced decay. After milling ceased, the machinery was used for a time to drive farm machinery - up to 1963. It is understood from the previous owner that the mill was overshot and was installed in 1851 (which would have been the time of occupation of Thomas Savins family. 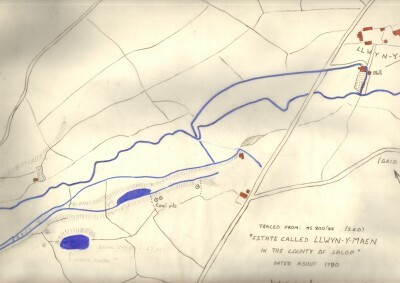 Interesting tracing from a record dated 1790 of the Llwynymaen Estate showing the water courses leading to the Mill. This shows a number of buildings on the west side of the Oswestry to Trefonen Road, two opposite Chain Lane, on the side of the road and one lower down the field. 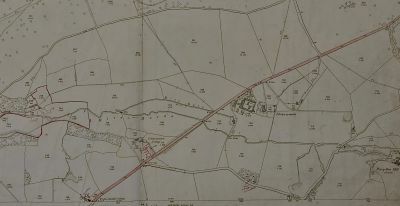 It is also interesting that it shows 3 coal mines in the field opposite Chain Lane. 1901 map showing the weir and mill race leading down to Llwynymaen Mill. 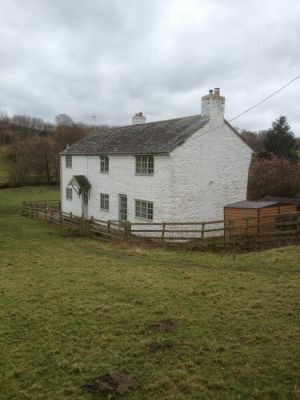 Photo of the former Llwynymaen Mill, now a private dwelling. 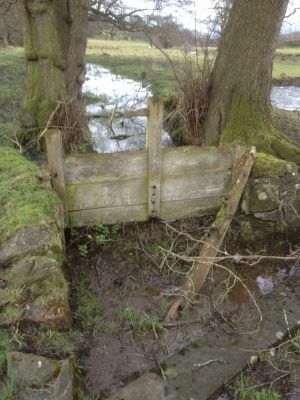 Photo of the sluice gate at the start of the mill race to Llwynymaen Mill. 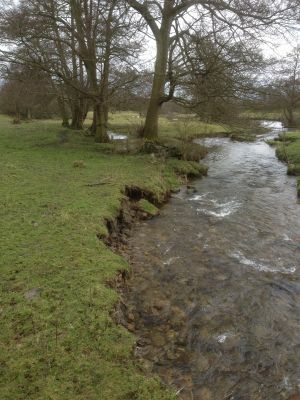 This photo shows where the Mill Race starts off the River Morda. To the right of tree in the centre of the photo used to be a weir with the water backing up towards the camera. 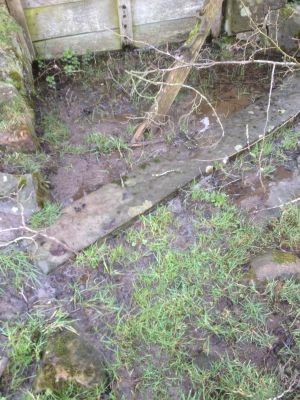 This raised the level of the water to enter the sluice gate at the start of the mill race. The weir has since disappeared but can be seen on the above map. Large 'pillar stones are still laying across the start of the mill race. See below photo.